Mini Jenny Doll in Ultra Violet, Bargain Shack offers Boyd Glass, Mosser Glass, L.G. Wright, and Contemporary Collectible Glass including Vaseline Glass - J.B. Scottie Dogs, Pooche, Animal Covered Nests, Toothpick Holders, Salts, Glass Animal Figurines, Clowns, Dolls, Slippers, Vehicles, and More! Meet the Miniature Jenny Doll in Ultra Violet. She stands a sweet petite 2-1/8" tall. Vi Hunter had the Mini Jenny created in only 23 different colors. 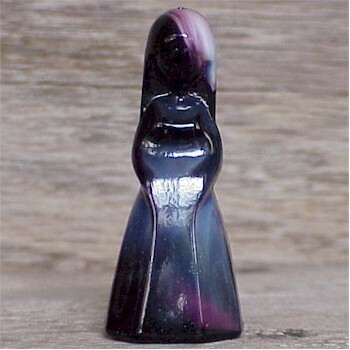 Since this is a slag glass the coloration varies a little on each doll.